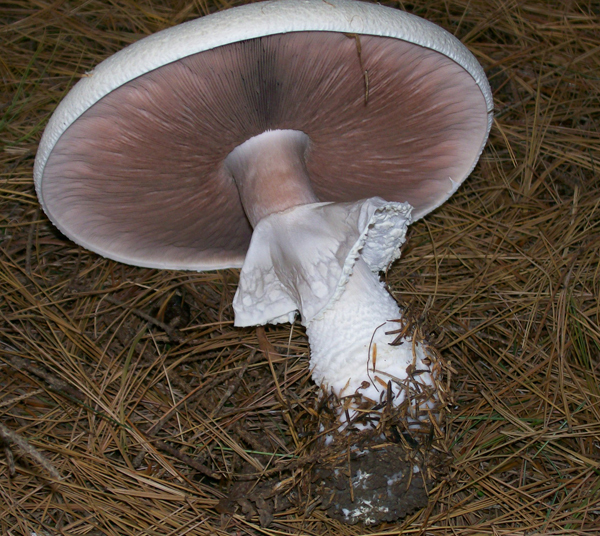 Commonly called the Horse Mushroom. 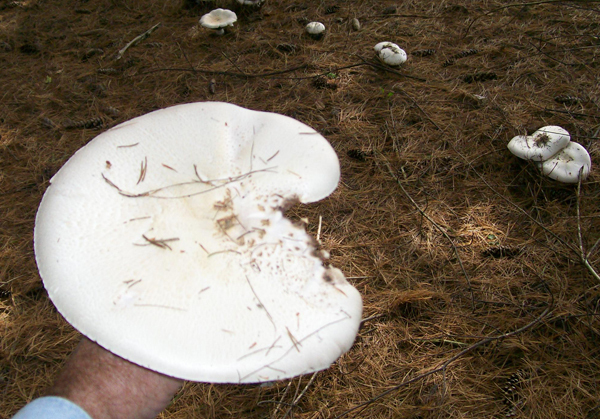 A very common wild edible Pennsylvania mushroom. Spring or Fall - usually. Summer if conditions are wet for a while. 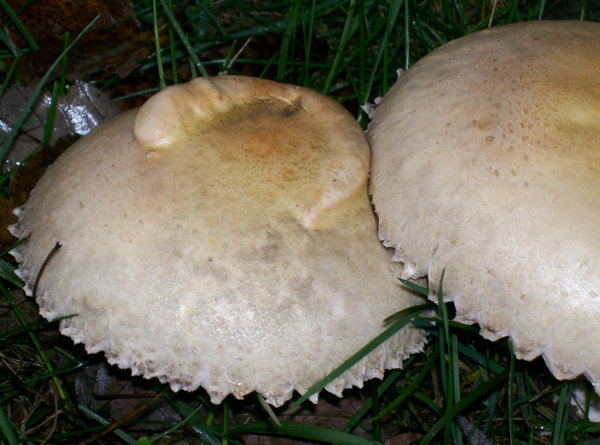 Conjecture is that the common name is derived from the mushroom's choice of habitat, that is, horse pastures. Check out the one mushroom in the top row - in the middle. I thought it was pretty neat to find a Horse mushroom with a horseshoe design on the cap! 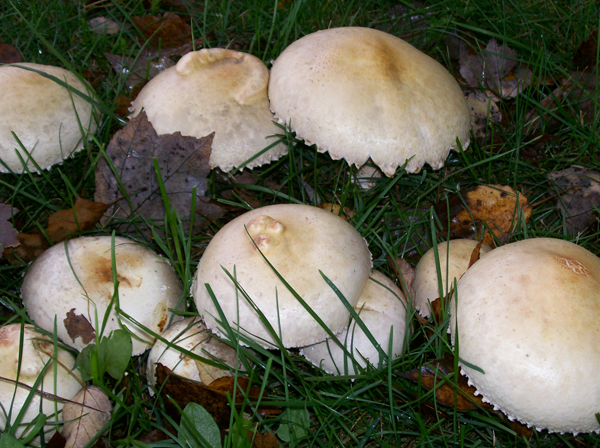 You will find these in groups in lawn areas - usually in someone else's yard, and usually the person that has these growing in their yard has no idea whether they are any good or not. They are just run over with the lawn mower with no remorse associated with that act. Many times you will find these in proximity to some type of pine. In our area a nice, well maintained grassy area, where some white pine is present, is a good spot. You will drive around all over the place in likely areas, keeping your eyes peeled, but eventually you will see a group growing in a yard that you don't have access to, in a field somewhere that is fenced in with electric zappers, or a lawn area where you can not find a place to pull over anywhere, on the way to a wedding or funeral with a car load of people or driving down the highway at 80 mph with no exit ramps nearby, etc., etc. Just a slight exaceration of course, but it happens so often that you start having delusions and you ask yourself if there is some mushroom strategy involved? Do they do this on purpose? - to always grow where access is limited. It's as if they know not to grow in your yard or the county park. That, better for them, to grow during weddings or where there are no exit ramps, etc. Get a load of these caps / buttons! - Click the photo for another view. Note the gill color. Usually described as pallid while young in mushroom guides, pallid being synonymous with the color of the palm's skin. These gills are just like my palm. Can't get any closer than that. Here is one I am holding that has just started to open up. See what they can look like when fully expanded but still pristine. This one's almost 12 inches. When a bit more mature the gills turn grayish, then brownish and eventually charcoal. Photo 1, view of the top --- Photo 2, from the bottom. Spore color is chocolate brown and if there is a group there is usually one cap growing over another where you can find some spores deposited to see the color - like in the photo below. Here's a before and after photo. You can see the deposit in the lower photo where the overlapping cap has been removed. Just do not gather these in lawn areas where chemicals may have been applied. 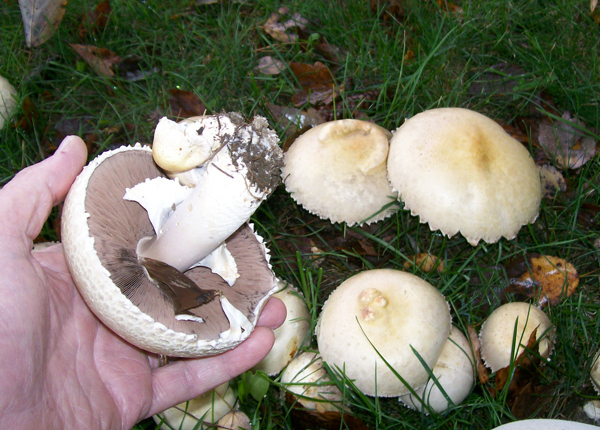 Mushrooms concentrate any impurities in the soil so if you get them from your local golf course or neighbors yard ( unless it's a yard like mine where no chemicals are ever used ) you will probably be getting some '.cides' amongst your little delectables. DATE - May 21, 2008, October 17, 2009. FOUND - "Three Churches", an area near Mammoth Park, Pennsylvania. A group of 7 or 8 were found in church lawn near maple tree. Three were large buttons( see top photo ). Four were slightly opened up. 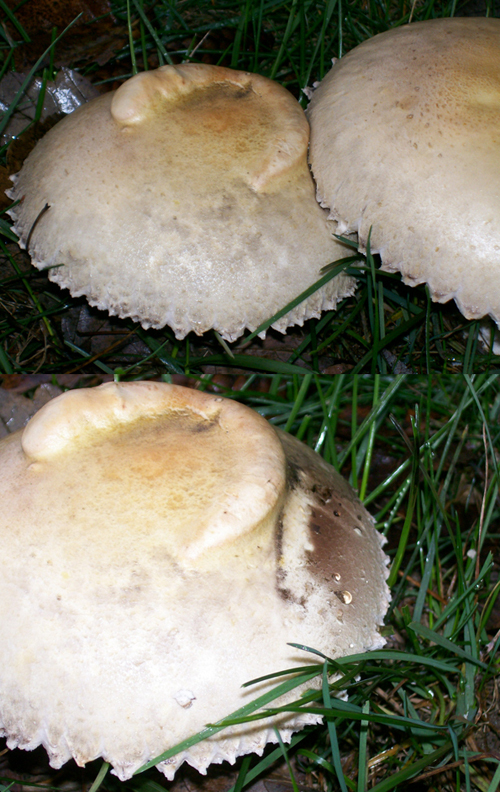 The ones in October were found at Cedar Creek County Park, Rostraver Township, Pa., in a grassy area. Weather conditions: a few days of damp Spring weather. 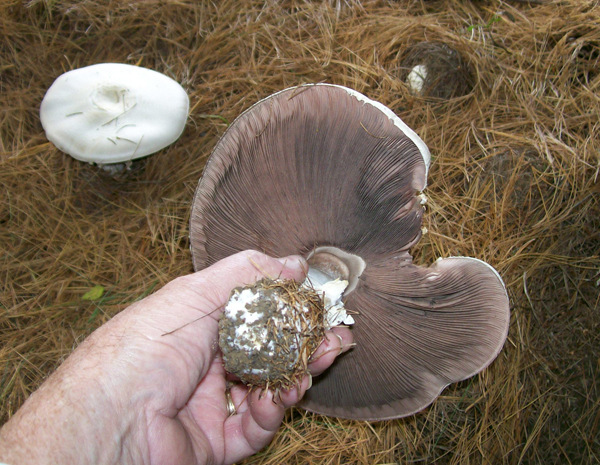 The Fall group were found after three days of cold drizzle - with a bonus - about 7 pounds of Shaggy Manes. 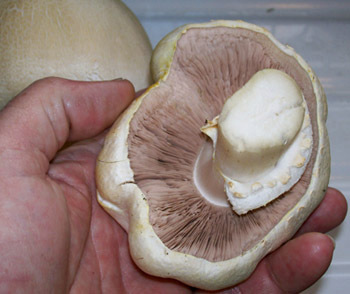 These Horse mushroom caps can get to be 10 to 12 inches wide under the right conditions.